Sidney’s Josiah Hudgins shoots as St. Marys’ Carson Fischbach defends during a nonconference game on Saturday in St. Marys. Ratez Roberts shoots with pressure from St. Marys' Ethan Steger during a nonconference game on Saturday in St. Marys. 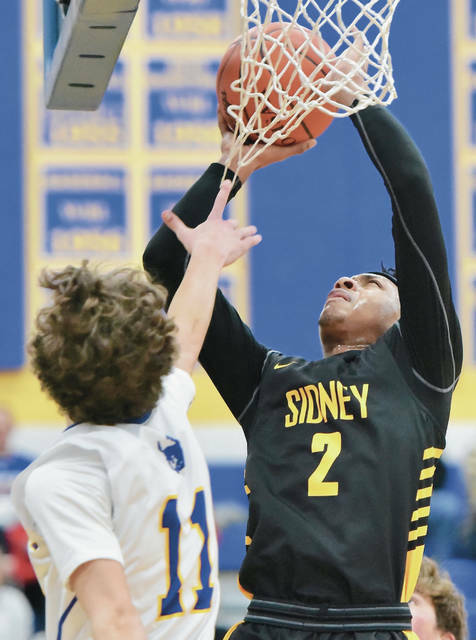 Sidney’s Andre Gordon tries to save a ball from going out of bounds as St. Marys’ Braeden Dunlap dives during a nonconference game on Saturday in St. Marys. Ratez Roberts dunks during a nonconference game on Saturday in St. Marys. Sidney’s Andre Gordon shoots as St. Marys Ethan Steger defends. Andre Gordon makes a layup as St. Marys' Ethan Steger defends at St. Marys Saturday. Ratez Roberts shoots as St. Marys' Carter Ballweg during a nonconference game on Saturday in St. Marys. 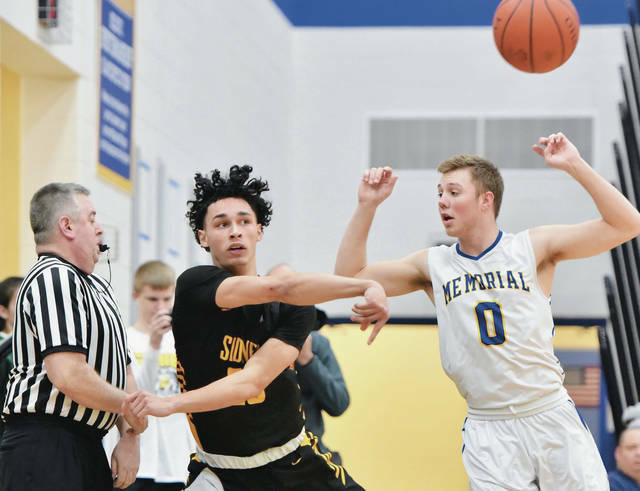 ST. MARYS — Trey Werntz used to light up the scoreboard as a freshman on junior varsity for Sidney two years ago, but he’s been a bench player on varsity the last two years and plays behind several experienced guards. With those experienced guards lagging early in a nonconference game at St. Marys on Saturday, Werntz got in and started lighting up the scoreboard again. Werntz scored 14 of his team-high 16 points in the second quarter to help the Yellow Jackets overcome a slow start and beat St. Marys Memorial 54-36. It was the fourth victory in the last six days for the Yellow Jackets, which will cap off a busy week on Monday at home against Lehman Catholic. 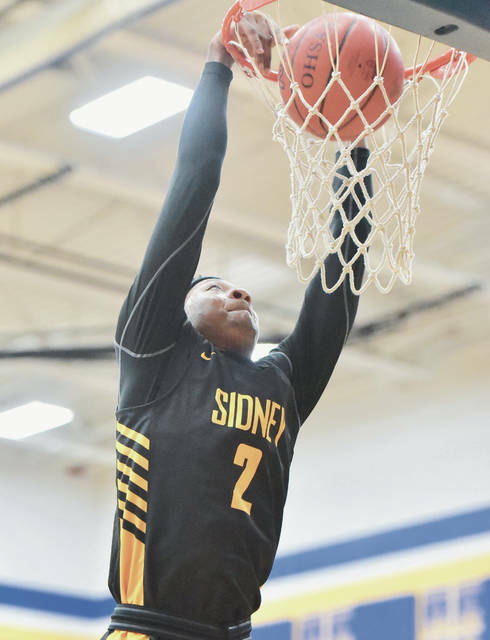 The long week looked to be taking an effect on Sidney (15-3) early on Saturday. 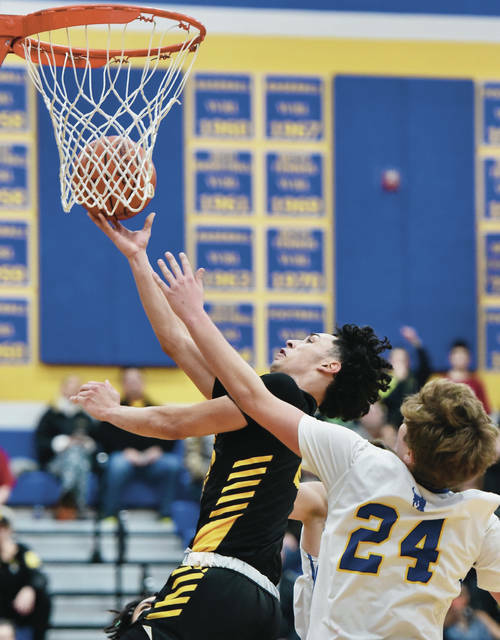 But Werntz sparked the offense in the second quarter and junior guard Dominick Durr came off the bench and scored seven late points to help the team put it away. 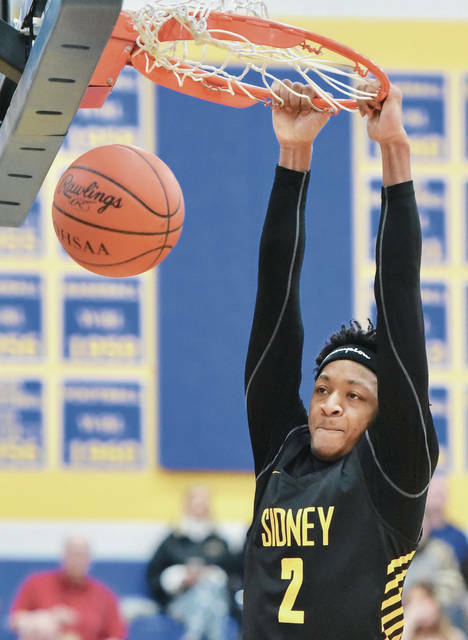 “I thought Dominick came in and played well, Trey came in and played well and Lathan Jones came in and played well,” Sidney coach John Willoughby said. “That’s what you need when you play this many games. You’re going to need to everybody. Werntz is one of the first players off the bench for Sidney. After sitting for the first quarter, he was inserted during the second on Saturday and helped breath life into a stagnate offense. He found a shooting groove against St. Marys’ zone defense. Andre Gordon added 12 while Ratez Roberts scored 10, including three thunderous dunks. Durr finished with nine. 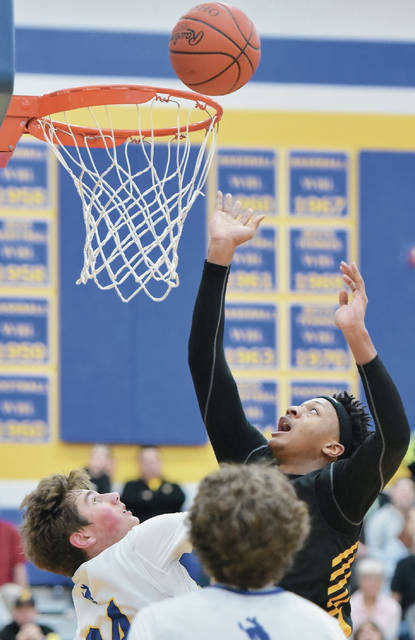 Gordon — who’s stylish final basket on a drive to the rim prompted St. Marys‘ public address announcer to imitate the SportsCenter jingle — played more of a traditional point guard role due to St. Marys’ defensive pressure. He succeeded and consistently worked the ball to Roberts, Werntz and Durr for open looks. Sidney fell behind 13-7 early in the second quarter but went on a 14-0 run to take control and built a 27-17 lead by halftime. Max Mielke scored seven points in the first three minutes of the third to help St. Marys (5-10) pull within 30-26, but the Yellow Jackets boosted the lead to 39-33 by the end of the quarter. Sidney then scored the first six points of the fourth on a breakaway dunk by Roberts, basket by Gordon and a put-back by Werntz to take a 12-point lead. Durr scored seven points in the last 2:13 to help Sidney run away. “It was almost like last night’s game (against Troy),” Willoughby said. “I was really happy with the way we defended all night, but we just weren’t there offensively sometimes. Thank goodness for our subs today. They made the difference. The teams struggled offensive early on. St. Marys led 6-3 after the first six minutes of play, but the teams found a shooting groove over the last two minutes of the first quarter. A dunk by Roberts with 1:06 left brought Sidney within 8-7, but Matt Mielke made a 3 with 12 seconds left to push the lead to four by the end of the quarter. Carson Fishbach made a basket to put the Roughriders up 13-7 with 7:38 left, but the Yellow Jackets scored the next 14 points. 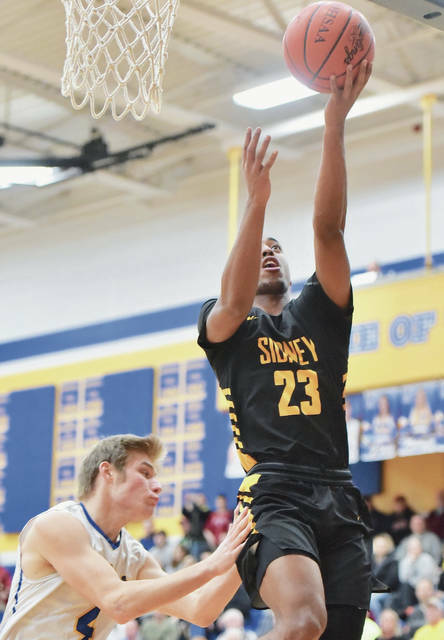 Gordon made a pair of free throws with 6:58 left and Roberts made a jumper with 6:05 left to pull Sidney within 13-11, then Werntz started scoring. Werntz hit a 3 from the top of the key with 4:54 left to put the Yellow Jackets ahead, then Durr made a jumper 50 seconds later. Werntz then made a reverse layup off a pass from Gordon and followed with a 3 with 2:21 left to give Sidney a 21-13 lead and cap off a 14-0 run. Werntz added two more 3s before the end of the quarter to help boost the lead to 10 by halftime. Werntz said the Yellow Jackets would love for their fifth win in a week’s time to come against crosstown rival Lehman (7-8). Ethan Steger led St. Marys with 17 points while Mielke finished with 10. Ratez Roberts shoots with pressure from St. Marys’ Ethan Steger during a nonconference game on Saturday in St. Marys. Andre Gordon makes a layup as St. Marys’ Ethan Steger defends at St. Marys Saturday. Ratez Roberts shoots as St. Marys’ Carter Ballweg during a nonconference game on Saturday in St. Marys. 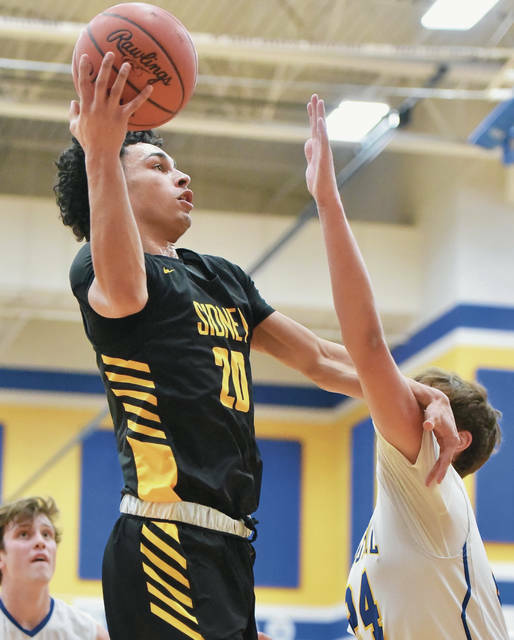 This entry was tagged Andre Gordon, boys, boys basketball, Dominck Durr, GWOC, high school, image, images, John Willoughby, photographs, photos, pics, picture, pictures, prep, Ratez Roberts, result, Roughriders, score, Sidney, st. marys, statistics, stats, Trey Werntz, WBL, who won, Yellow Jackets. Bookmark the permalink.